DIN Standards are issued for a variety of components including industrial fasteners as Metric DIN 912 Socket Head Cap Screws. 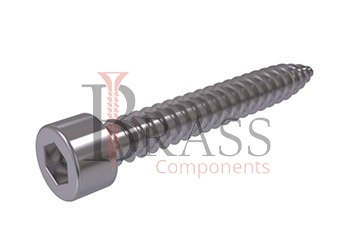 DIN 912 Screws are manufactured from stainless steel Grade A2 and A4, Brass, Carbon Steel or many other materials. DIN 912 Screws are available in a wide range of sizes, shapes and materials. Standard Grade Strength Class 8.8 and 12.8. Available with Unique Shear Requirements which can be satisfy by Grade 10.9. Provide Greater Tensile Strength than equivalent Hex Head Cap Screws, while requiring less surface area to Counterbores. Plain finish, or bare metal, may or may not have a coating of light oil to resist corrosion. 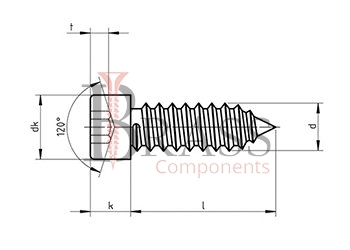 Screws with Cylindrical Head DIN 912 with an internal Hexagon are a metal stud with incomplete metric thread and a high cylindrical head with a slot type hexagon. Available with Internally tapped Hole and Mated with a nut. Tension on the Socket Cap Screw is induced by rotation of the screw head. Complies with ISO 4762, BS 4168-1 and NEN 1241. With Hexagon Recess, it is Possible to tighten the fasteners as fast as possible and perform fast assembly on the conveyor using electrical and pneumatic devices. Multiple Screwing of the fastener does not lead to wear of this type of slot. DIN 912 Screws are primarily distinguished by their resistance to corrosion damage. DIN 912 Screws are practically non-magnetic, have increased strength and provide longer service life. Hexagon Socket in the head is available which accepts a hex wrench to tighten the socket cap screw. The point at the threaded end of the socket cap screw is machined flat so it will fit into a drilled hole. Ideal for precision work with close tolerances and applications needing a well tooled appearance. Widely used in road and building engineering, in the creation of structural fastening, in the field of engineering and instrument making, etc. Designed for insertion through a close tolerance. We manufacture DIN 912 Screws as per Custom Specification and export in France, Italy, Switzerland, Poland, Greece, UK and other European Countries. For more Information, Please Contact Us or Inquiry Now.